I am off to spend three weeks in Australia so probably won't blog while I'm away. A Banana in Australia has given me some suggestions for restaurants . The meal I'm most looking forward to though is our lunch at Tetsuyas . Hopefully I can find the great bookstore Niki found when she was in Brisbane recently. If anyone has any recommendations for the Gold Coast or Brisbane do leave a comment. On the day Clotilde is meeting up with New York readers of her wonderful blog Chocolate and Zucchini I shall be in Sydney having brunch with Madame Shawshank. As we met via C&Z , it seemed appropriate I should take her a small gift from my kitchen. 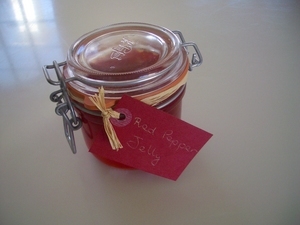 I decided on this Red Pepper Jelly which is wonderful either on toast or as an alternative to quince paste with cheese. The recipe was given to me back in the eighties by my friend Vivienne. I have not made it in years. After enjoying it with some blue cheese over the weekend I think I will keep a jar in the fridge. I have bought a similar but spicier version of this from the wonderful little Basque village of Espelette . Put peppers,vinegar, water and pectin in a large pan. Boil, stirring frequently for 5 minutes. Add sugar and boil briskly until set. I use a candy thermometer and boil it to to jelly stage. Put into clean sterilised jars and seal. Serve with cheese or as a spread on bread. All the codes you need to add accents to European words can be found here. 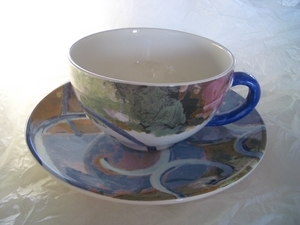 When I was shopping in Smith and Caugheys today I treated myself to this beautiful piece of Gien china . Isn't it beautiful? 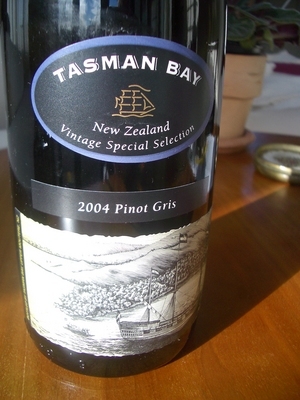 It is from the Chaise Bleue range. This French company was originally founded in 1821 by an Englishman . The factory shop and museum , both in Gien, are now on my list of things to do next visit to France. There are also two stores in Paris and one in Brussels . It's never to late to start your Christmas wish list. I hope my family are reading this! 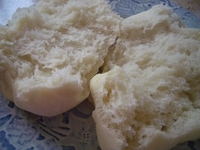 I had never considered making English Muffins until I came across this article in a recent Listener magazine . These are the very muffins enjoyed by the family of Marion Maddox who happens to be the wife of one of my heroes, the brilliant food historian Michael Symons . The dough is made the night before, rises overnight, is shaped the next morning and left to rise for a second time (while you shower), cooked on the griddle.............and the result......warm fresh muffins for breakfast. The dough is quite sticky. 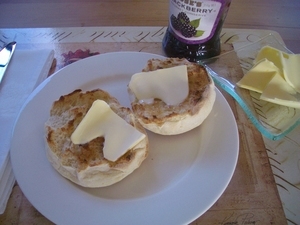 The finished muffin - very nice eaten as is or toasted as in top picture. Put the yeast and sugar in a small bowl with half the warm water. Stir and set aside for a few minutes, then add the remaining water and the milk. Put the flour and salt in a large bowl and use your hand to mix in the yeast, water and milk mixture. Knead the mixture which will be sticky, thoroughly in the bowl (or use the dough hook of an electric mixer). Cover the bowl with a damp tea towel and set aside to rise until more than doubled in bulk. Although this may take only a couple of hours, the dough can be allowed to rise overnight. 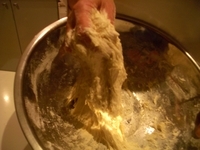 Deflate the dough by pulling it away from the sides of the bowl. Lift it out of the bowl and divide into 8 pieces. Drop each piece on to a tray liberally dusted with rice flour or fine cornmeal and roll them over until well coated. Form each piece into a thick disc. Place the disks on a baking tray and place another tray on top. Leave to rest and rise 20 minutes, then remove top tray. Place a cast iron griddle or large frying pan over low heat. When only moderately hot place four of the muffins on it and cook for about ten minutes until light beige on the bottom. Turn the muffins over and cook the second side for a similar length of time. Wrap the cooked muffins in a dry tea towel while you cook the remaining four. Pull apart and eat while still warm. For toasting pull the muffins apart and toast on both sides.